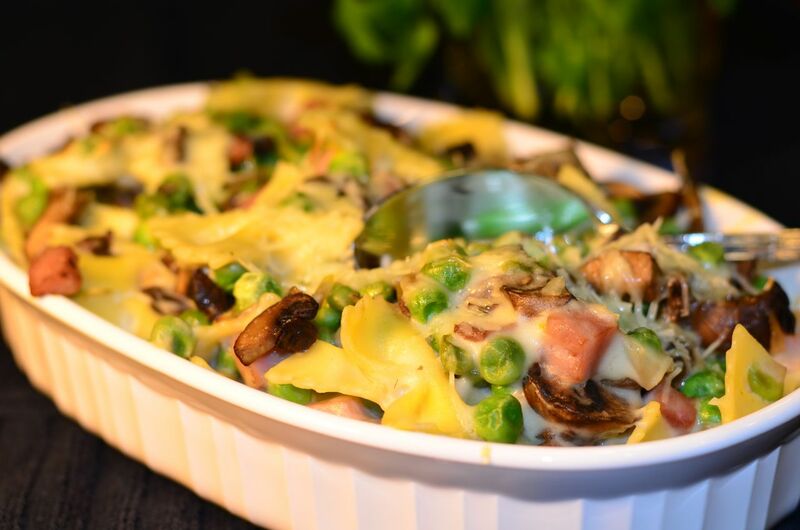 Bow Tie Noodles with Peas, Ham and Mushrooms | Mary Duke Cooks! Doc and I went to Italy a few years ago. It was lucky for us that we went on a bus tour because we never got the hang of the train system. The last night of our trip we traveled by train from the airport to Rome (about a 1 hour train ride) We had a romantic dinner in Rome and were headed back when we got lost and couldn’t find the transfer station to the train line headed to the airport. It didn’t help that the stations had different names depending on what direction you were going! We kept doing the “loop-de-loo” until the trains closed for the evening! Now we were in a pickle because we had spent almost all of our euros. We scraped every bit of money we had together and had just enough to take a taxi back to Rome where we could find an ATM, secure money then take a taxi to the airport. This would have been an easy fix if the Italian National Parade complete with 2 hours worth of tanks, horses and military brigades had not started parading down the streets of Rome at midnight. It took an hour to find a taxi, an hour to wait for the parade to pass, and 2 hours to get to the airport hotel. At 4 am we just had 2 hours to sleep, get dressed and get to the airport. Oh, and did I fail to mention that our luggage never made it from Sorrento to Rome? We redressed in sweat filled clothes from the day before. I now NEVER travel without a change of clothes and makeup in my carry on. Why? When we arrived in Charlotte, the security guard took one look at me and didn’t think I looked like my passport picture! He kept looking at my picture then looking at me. I finally said, “This is what I look like with out makeup and he laughed! This recipe is from our final evening in Rome before our crazy adventure began! It has a béchamel (white sauce) and is a rich dish that pairs well with red meat. Preheat oven to 350 degrees F. Spray a 2-quart glass baking dish with non-stick spray or spray 8 individual ramekins. In a large frying pan heat 1 tablespoon of the olive oil over medium heat. Add shallots and sauté 4 minutes; add ham and cook 1 minute. Remove from pan and set aside. Add 1 tablespoon olive oil and mushrooms to skillet and sauté until the mushrooms release their juices and continue cooking until the the juices evaporate; about 8 to 10 minutes. Add salt, pepper, ham, shallots and peas. Cook 2 minutes; remove from heat and set aside. Cook pasta according to package directions subtracting 2 minutes from the cooking time. Do not drain until you are ready to assemble the dish. While pasta is cooking, make white sauce. In a medium saucepan, over low heat melt butter then stir in flour and 1/2 teaspoon salt. Stir constantly with a wire whisk for about 2 minutes or until the roux just begins to brown. Increase heat to medium. Add milk and continue to stir as the milk heats up and the sauce thickens. This will take about 10 minutes. Mix in 3/4 cup Parmesan cheese. Add the pea, ham, and mushroom mixture. Drain the pasta and add it to everything else. Pour into 2 quart Pyrex or 8 individual ramekins. Sprinkle with remaining 1/4 cup cheese and dot with butter. (At this point you can bake and serve or you can cover and refrigerate until you are ready. If you refrigerate, increase baking time or let come to room temp before baking). Bake until cheese melts 10 to 15 minutes.